Parking Structure #2 at California State Polytechnic University Pomona is located along the southern edge of the rapidly growing campus. 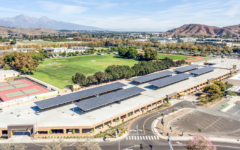 The structure primarily serves the University but also provides parking for the neighboring I Poly High School, a college preparatory high school located on campus. An elevated bridge crosses the garage and provides safe vehicle-free access to campus for students. 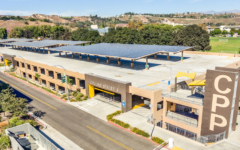 The Wi-Fi enabled facility accommodates parking for 1,825 cars and includes 24 EV charging stations, enclosed bicycle parking and a photovoltaic array on the roof level. 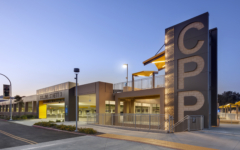 Conveniently accessed through six entrances around the perimeter, the adjacent roadway running the length of the garage also includes multiple campus shuttle stops. 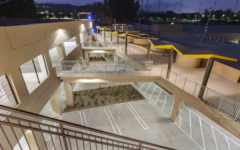 Designed with one level below grade, the low-profile garage was specifically designed to minimally impact views of the campus and surrounding mountains. In order to eliminate the need to mechanical ventilation, areaways were located around the perimeter of the building to allow natural ventilation and light to penetrate the lower level.